Dimensions 0.75 by 7.25 by 8.50 in. Amazon.com description: Product Description: Not satisfied with the new T-shirts on sale at the local mall? Maybe you'd like a wedding invitation that expresses your own vision, not your party planner's? How about some personalized stationery? An upgrade to your website? A business card? A poster for your political campaign? A CD package for your band? Sound good? Then get up off your couch and Design It Yourself! Avoid graphic identity theft: build your own. Ellen Lupton, bestselling author of Thinking with Type, will show you how. - simple ideas on how you can "think like a designer"
No more excuses. With this book, virtually any design task is within your grasp. Just do it (yourself)! from Princeton Architectural Pr (July 30, 2008); titled "D.i.y. Design It Yourself"
About: Sind sie unzufrieden mit den neuen T-Shirts, die in Ihrem örtlichen Kaufhaus angeboten werden? About: Not satisfied with the new T-shirts on sale at the local mall? 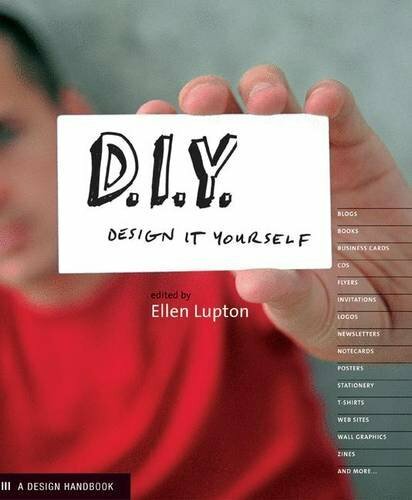 from Chronicle Books Llc (October 30, 2005); titled "Diy: Design It Yourself"